As part of an ongoing battle against invading swarms of giant jellyfish in local waters, some residents of Fukui prefecture have developed a method for converting the sea creatures into a powdered ingredient used in souvenir cookies. 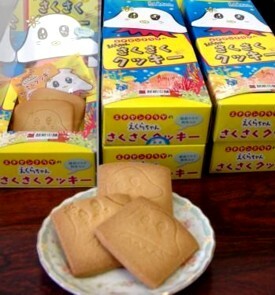 Sold in boxes of 10, the jellyfish treats, called "Ekura-chan saku-saku cookies," can be purchased at JR Fukui station for 580 yen. The key ingredient in the Fukui-area cookie maker's recipe is powder made from dried, ground jellyfish, which is produced using a process developed three years ago by students from Obama Fisheries High School. The bitter, salty flavor of the jellyfish is said to nicely complement the cookie's sweetness. 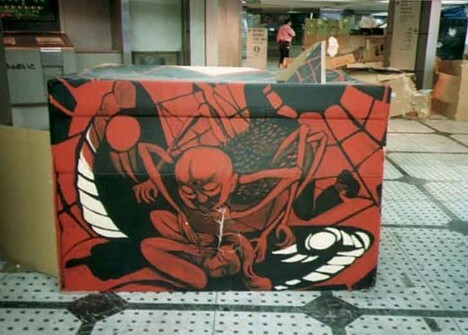 In recent years, swarms of Echizen kurage (Nomura�s jellyfish) have been invading the Sea of Japan each autumn, seriously disrupting fishing operations. The giant jellyfish can grow up to 2 meters wide and weigh up to 200 kilograms (450 lbs) each. A new project to develop "unmanned hotels" in Japan may soon eliminate the burdensome task of checking in at the front desk. A consortium of five companies, including the trading company Itochu and consumer credit provider Orico, are working to develop a network of hotels that rely on an online reservation and payment system, RFID-enabled Orico credit cards that serve as keys, and RFID-enabled door entry locks. When hotel guests reserve a room online with their RFID-enabled credit card, a "key" is assigned to the card. Since the credit card is the key, guests can bypass the check-in process and proceed directly to the room at the allotted time. 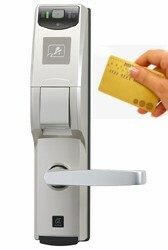 The door lock recognizes the IC chip embedded in the credit card, opening for the guest upon arrival. The system eliminates the need for front desk staff to remain on duty. Other companies involved in the project are Kesaka System, who are developing the entry locks, as well as Espace Construction and Miyabi Estex, who are handling construction and development. 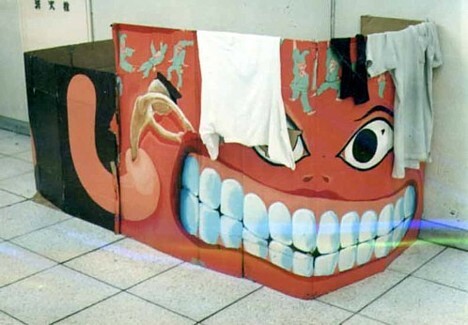 Japanese law requires hotels to maintain staffed front desks, so the unmanned hotels will not be completely staff-free. 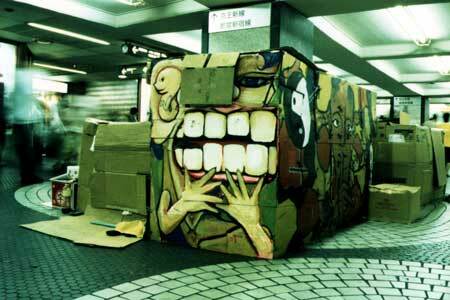 However, the hotels are expected to require only half the ordinary number of personnel. A dozen or so of these hotels are scheduled to begin operations nationwide in 2008. A pair of baby albino Japanese Giant Salamanders (Andrias japonicus) discovered this past spring in a mountainous area of Hiroshima prefecture are being kept at Hiroshima's Asa Zoo for the purpose of ecological research. The two specimens were found along with three other albino salamanders at the same location. The Japanese Giant Salamander, which can grow up to 140 cm (4 ft. 8 in.) long and live for up to 80 years, is an endangered species that has been officially designated one of Japan's living national treasures. Young Japanese Giant Salamanders typically have black skin that develops into a mottled brown and black with age, and the occurrence of albinos is extremely rare. The discovery of a group of albino Japanese Giant Salamanders is unprecedented. The salamanders were discovered in a mountain stream near the town of Kitahiroshima when farmers were diverting water to their fields. A sandy area became exposed as the water level fell, revealing a group of thirty salamander larvae, five of which were albinos. Chie Ashikaga, a zookeeper with 35 years of experience in raising Japanese Giant Salamanders, says, "I've never heard of anyone finding five albinos together. This is due either to environmental changes or to genes passed on by one of their albino parents. With many mysteries surrounding the Japanese Giant Salamander, these specimens might give us a better understanding of the ecology." Asa Zoo will place the albinos on public display beginning October 21. On October 19, East Japan Railway Company (JR East) made a test run of its NE Train (New Energy Train) -- the world's first fuel cell hybrid train -- in Yokohama's Kanazawa ward. With two 65-kilowatt fuel cells and six hydrogen tanks under the floor and a secondary battery on the roof, the clean train emits only water and runs without receiving juice from power lines. The train can travel at a maximum speed of 100 kph (60 mph) for 50 to 100 km (30 to 60 miles) without a hydrogen refill. Thirty passengers boarded the train for the test run, which consisted of a series of back-and-forth jaunts along a 300-meter test track. The train smoothly accelerated to a maximum speed of 50 kph (30 mph), providing a ride quality no different from an ordinary train. A separate fuel cell train is under development by the Railway Technical Research Institute (RTRI), but the NE Train differs in that it is a hybrid relying on a secondary battery that stores electricity generated during braking. The secondary battery provides auxiliary power during acceleration or when fuel cell power is insufficient. 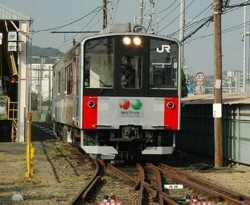 JR East hopes to see hybrid commuter trains in widespread use in 10 to 20 years. Lowering the cost and improving the mileage of fuel cells is a serious challenge, but the effort is not without reward. In addition to environmental benefits, eliminating the need for unsightly power lines means lower infrastructure costs and a prettier landscape to look at from the train window. Testing of the train on public tracks will begin next April. 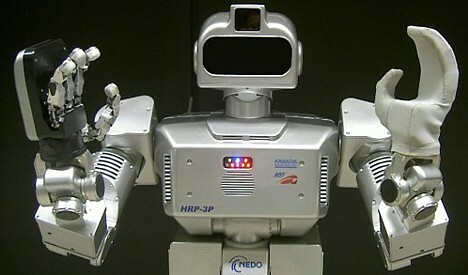 Nomura Unison Co., Ltd. has developed a walking-assistance robot that perceives and responds to its environment. The machine, called Walking Partner Robot, was developed with the cooperation of researchers from Tohoku University. It will be unveiled to the general public at the 2006 Suwa Area Industrial Messe on October 19 in Suwa, Nagano prefecture. The robot is equipped with a system of sensors that detect the presence of obstacles, stairs, etc. while monitoring the motion and behavior of the user. Three sensors monitor the status of the user while detecting and measuring the distance to potential obstacles, and two angle sensors measure the slope of the path in front of the machine. The robot responds to these measurements with voice warnings and by automatically applying brakes when necessary. Walking Partner Robot is essentially a high-tech walker designed to support users as they walk upright, preventing them from falling over. 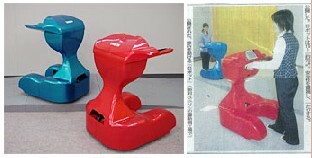 The user grasps a set of handles while pushing the unmotorized 4-wheeled robot, which measures 110 (H) x 70 (W) x 80 (D) cm and weighs 70 kilograms (154 lbs). Walking Partner Robot is the second creation from the team responsible for the Partner Ballroom Dance Robot, which includes Tohoku University robotics researchers Kazuhiro Kosuge and Yasuhisa Hirata. The goal was to apply the Partner Ballroom Dance Robot technology, which perceives the intended movement and force of human footsteps, to a robot that can play a role in the realm of daily life. The result is a machine that can perceive its surroundings and provide walking assistance to the elderly and physically disabled. The developers, who also see potential medical rehabilitation applications, aim to develop indoor and outdoor models of the robot. 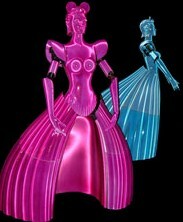 The company hopes to make the robot commercially available soon at a price of less than 500,000 yen (US$4,200) per unit. The skyfish (also known as "rod" or "flying rod") is a type of cryptid that flies through the air at speeds faster than the human eye can see. Here are two promotional videos (with English subtitles) for a set of Japanese DVDs documenting how to catch skyfish. About halfway through the second video, one of the skyfish hunters shows off his spoodle, a special tool used for catching skyfish. According to this spoodle website, there are 100 ways to use the tool -- including a number of practical uses not related to catching skyfish. 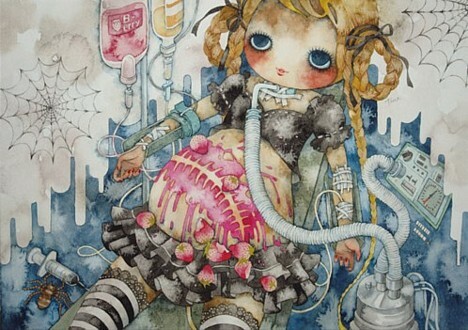 A set of two spoodles and a skyfish decoy sells for 57,454 yen (US$499). Visit the Skyfish Maniax website for details on how to purchase the DVDs (which do not yet appear to have been subtitled in English). 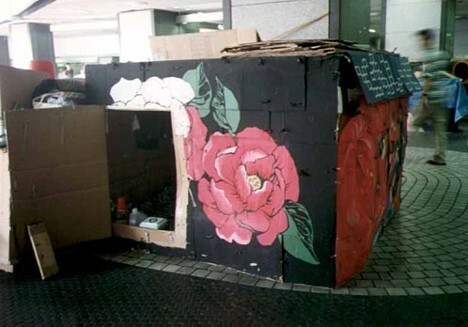 These photos show painted cardboard shelters in the homeless city that took root in the underground sprawl of Shinjuku station's western wing in the mid-1990s. A deadly fire swept through the community in February 1998, forcing the inhabitants out and conveniently allowing the city to proceed with long-awaited plans to construct the moving walkway that now exists there. 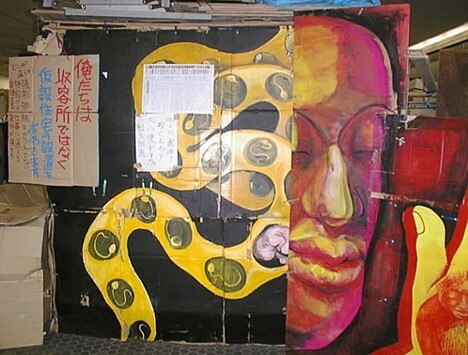 The paintings were also lost in the fire. 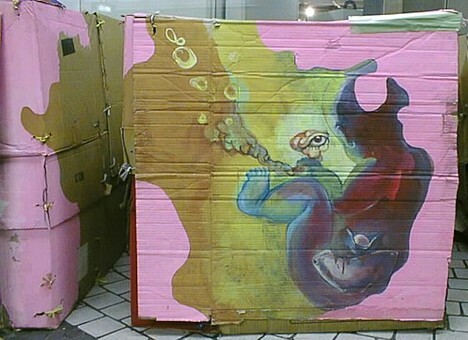 The cardboard house painters were Junichiro Take, who once spent 22 days in jail for performing his art in Shinjuku station, along with Takeo Yoshizaki, Yasuhiro Yamane, Itohisa Takano and others. Check out the full gallery here and read more background information here. 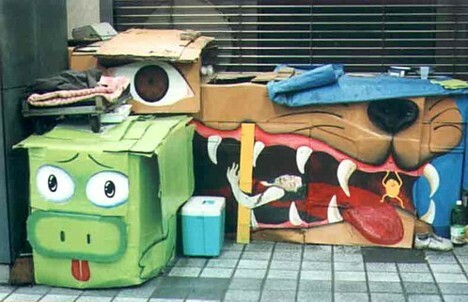 See more photos at Eyedia's gallery of Shinjuku cardboard house paintings.